When you play this card, look at up to 7 cards from the top of your deck. 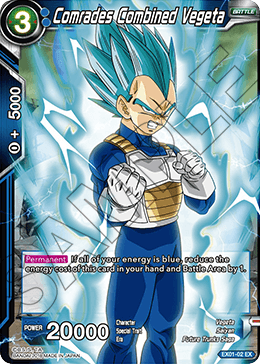 Choose up to 1 blue ＜Vegeta＞ among them with an energy cost of 3 or less and play it in Rest Mode. Then, place the remaining cards on the bottom of your deck in any order. 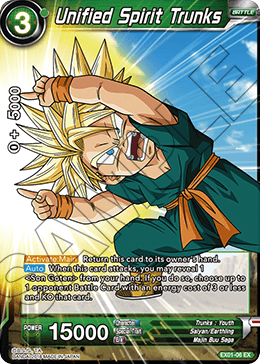 If all of your energy is blue, reduce the energy cost of this card in your hand and Battle Area by 1. When you play this card, look at up to 7 cards from the top of your deck. 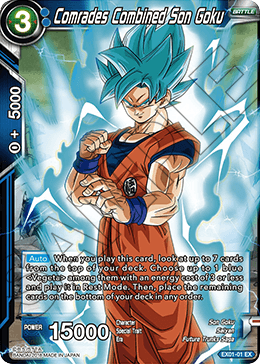 Choose up to 1 blue ＜Vegito＞ among them with an energy cost of 8 or less and add it to your hand. Then, shuffle your deck. When this card attacks twice in the same turn, it gains for the duration of the turn. Return this card to its owner's hand. When this card attacks, look at up to 7 cards from the top of your deck. Choose up to 1 ＜Trunks : Youth＞ among them with 15000 or less power and add it to your hand. Then, shuffle your deck. 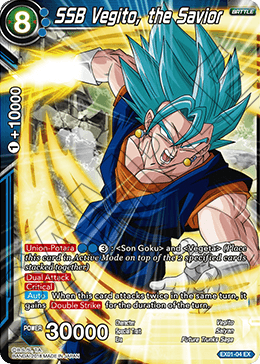 When this card attacks, you may reveal 1 ＜Son Goten＞ from your hand. 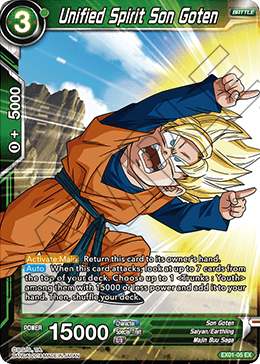 If you do so, choose up to 1 opponent Battle Card with an energy cost of 3 or less and KO that card. 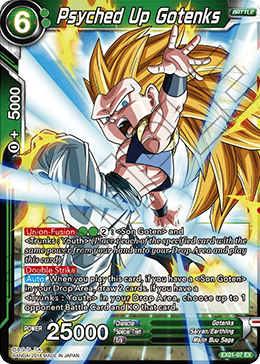 When you play this card, if you have a ＜Son Goten＞ in your Drop Area, draw 2 cards. 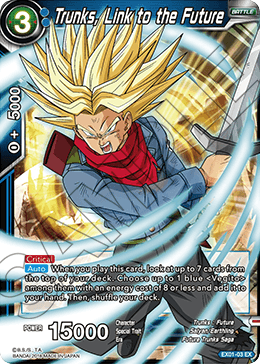 If you have a ＜Trunks : Youth＞ in your Drop Area, choose up to 1 opponent Battle Card and KO that card.